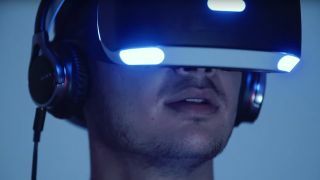 As PlayStation VR nears ever closer to release, Sony revealed a new feature of the headset that essentially transforms its display into your personal 226-inch TV. Coined "Cinematic Mode," the PSVR can turn movies or games running on your PS4 into an ultra-widescreen affair. The information was originally released by PlayStation's Japanese blog, demonstrating the feature with Uncharted 4: A Thief's End and Robert Zemeckis' The Walk - a film we can only imagine induces ungodly cases of vertigo in VR. Users have three screen sizes to choose from with Cinematic Mode - a large resolution simulating a 226-inch screen, a medium-sized 163-inch display, and a smaller setting of 117 inches. Sony sets the medium as the default, likening the largest setting to sitting front-row at a movie theater. The smaller setting, however, can easily adjust to the viewer's head movement - perfect for if you decide to lie down after a few hours upright VR viewing. In addition to playing back your games and Blu-rays in virtual reality, Sony added that the PSVR will also support 360-degree video and photography played through the PS4's media player. In theory, Cinematic Mode could also function as an emergency screen, such as when you need to play Persona 5 but TV in the living room is busy showing the big game. It could possibly also serve as a way to take your PS4 out on trips without lugging a cumbersome rectangular monitor in tandem. That said, one downside could be that such a large display may have gaps between pixels - a common issue in VR called the screen door effect - that wouldn't beat out a conventional TV in terms of pure picture quality, UploadVR points out. Still, it's nice to dream - especially when we just know March Madness is gonna mess with our Persona-playing schedule.